€1080 per person including one night at Deluxe Camp. Upgrade to a Private Camp for an extra €65 per person. Saffron is a spice derived from the flower of Crocus sativus, commonly known as the ‘saffron crocus’. Saffron crocus grows to 20–30 cm (8–12 in) and bears up to four flowers, each with three vivid crimson stigmas. The styles and stigmas, called threads, are collected and dried to be used mainly as a seasoning and colouring agent in food. Saffron is one of the world’s most costly spices by weight. Its aroma is often described by connoisseurs as reminiscent of metallic honey with grassy or hay-like notes, while its taste has also been noted as hay-like and sweet. 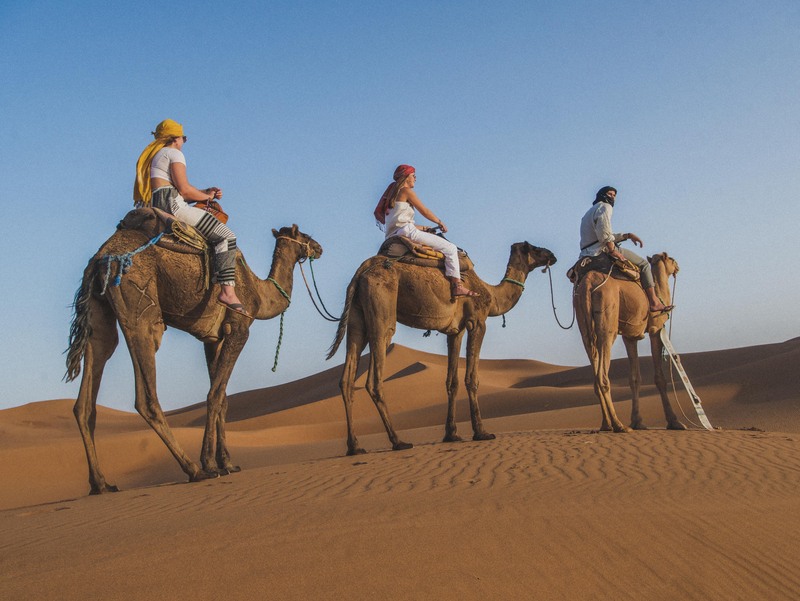 With this 7 days circular tour explore the Sahara Desert of Morocco both by foot and jeep. 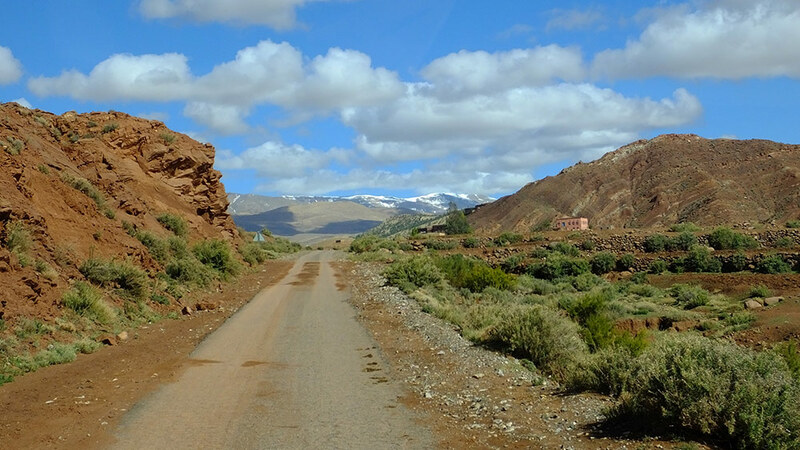 Cross the Atlas mountain range at its two most renowned high passes, each above 2000m, the Tichka and Test passes. Enjoy Morocco’s southern hospitality in characterful kasbah guest houses. 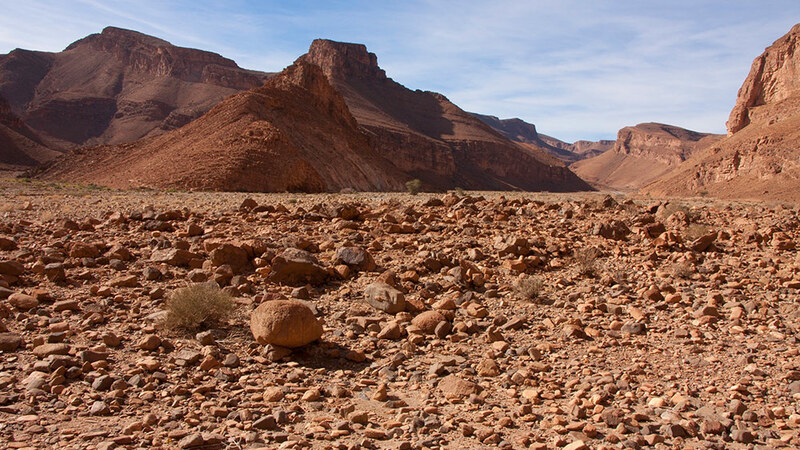 A great introduction to Morocco’s outdoors for those who wish to combine a desert hike, and camping off the beaten path, with comfortable rural accommodation. Option to wake early to bake bread with some of the Berber neighbours in their home. Take breakfast and also sample the fresh bread once it is baked. (You won’t be able to do so if you opt to stay at Ksar Ighnda guest house – you could instead take an early morning guided walk from Ksar Ighnda). 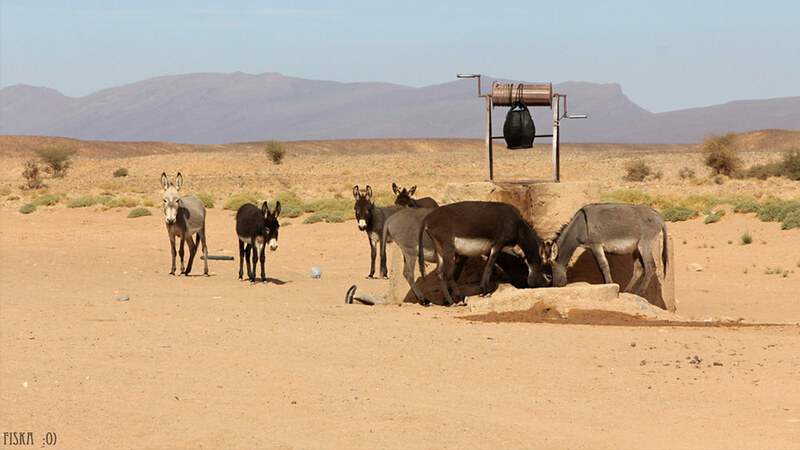 Thereafter, set off for the day’s drive to Zagora to bypass Ouarzazate, and then cross the outer reaches of the Anti-Atlas mountain range to join the course of the Draa Valley at Agdz. The route follows the Draa southwards (the Draa is Morocco’s longest river, flanked by glorious palm oases & crumbling kasbahs). We suggest you overnight at Zagora palm grove to minimise the driving hours. Proposed guest house in Zagora is Villa Zagora. You will have chance to enjoy the pool on arrival and take a late evening walk in the palm grove. After breakfast, drive south to the end of the tarmac road at the village of M’hamid El Ghezlane. Driving beyond M’hamid a short distance, and then off-road, reach the end of the M’hamid palm groves before the desert terrain opens out. Stopping under shade, you will rendez-vous with your desert guide and camel caravan. Lunch should be prepared and waiting for you. After lunch, the camels will be loaded and then you will trek by foot in to the desert during this and the following morning, aiming west towards Erg Chigaga Great Dunes. Your driver and vehicle will meet you the next day after lunch. Trekking duration today approx. 3 hours. 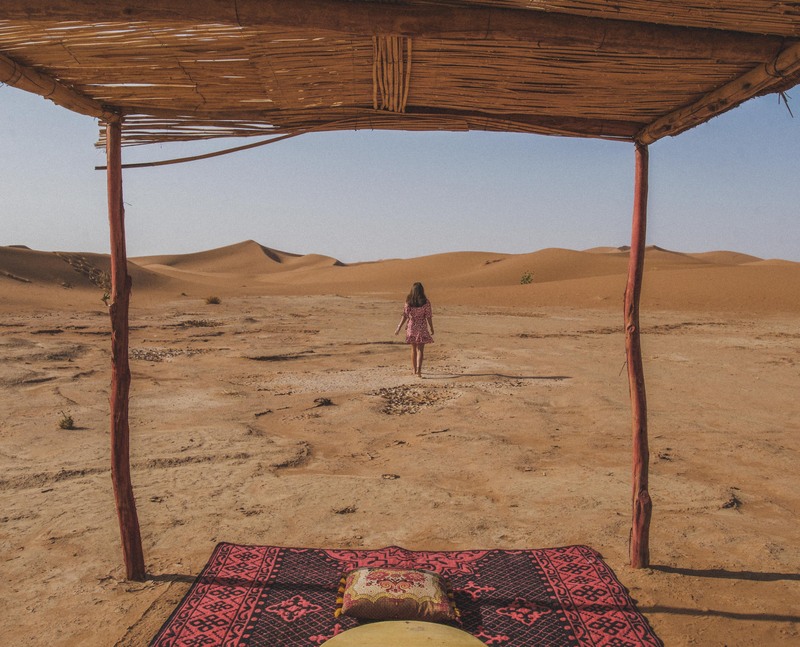 Late afternoon, wild camp will be established in the seclusion of small dunes, a fire lit, dinner prepared, and, after dinner, some fire-side singing with your Berber hosts. After breakfast, camp is struck and the morning’s trek will continue westwards. Trekking duration today approx. 3 hours, with break for lunch under the shade of Tamarisk trees. The terrain is ever-changing, with desert scrub and broad plateaux. Option to ride by camel-back during the trek. After lunch, your driver and vehicle will collect you to transport you the remaining distance across the desert (approx. 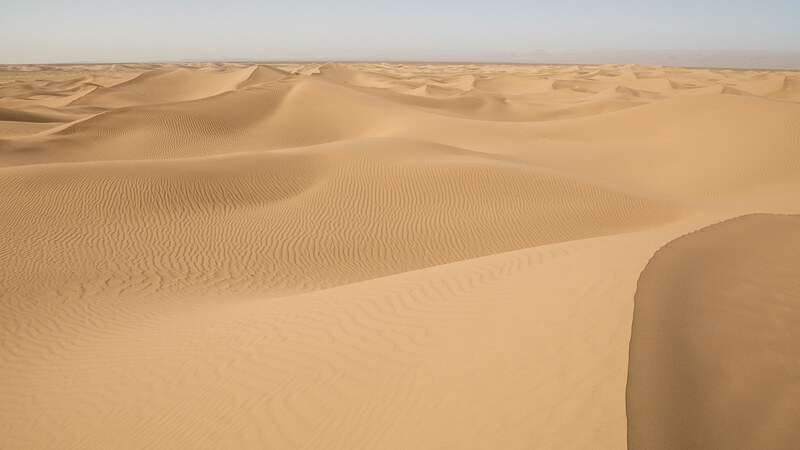 1 hour off-road drive) to a fixed desert camp at Erg Chigaga great dunes (either a Deluxe Camp or a simple Berber Camp). Expect to arrive at the desert camp late afternoon with chance to freshen up before walking out on to the rolling dunes. Watch the sunset from a vantage point. Enjoy music next to the campfire after dinner. Overnight at the fixed desert camp for one night. After breakfast, enjoy a relaxing morning and exploring the dunes by foot. Leave the camp and drive out of the desert in the opposite direction to how you arrived, i.e. north-west. 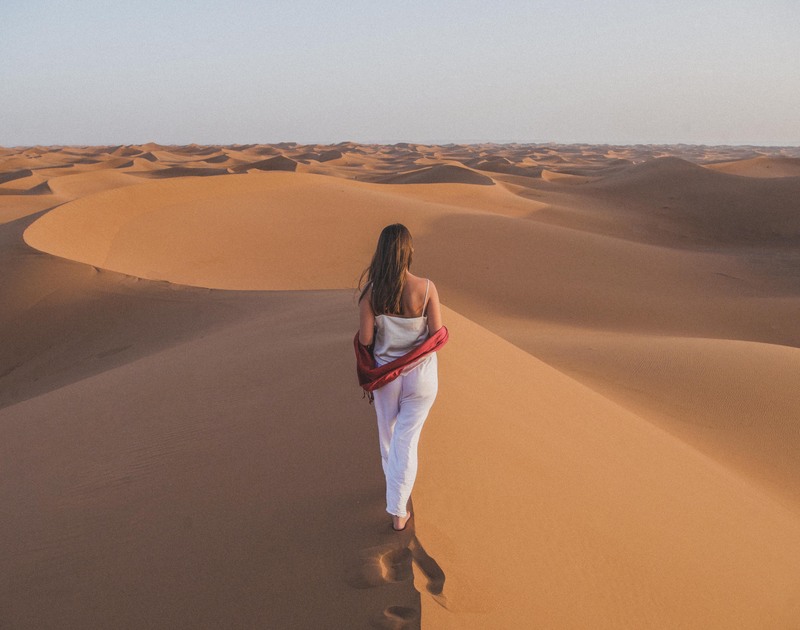 Drive off-road across the desert for 90km to the town of Foum Zguid, via arguably some of the finest remote scenery in Morocco (including the vast dried salt flats, at Lake Iriqui, the imposing mountain ridges of the Jebel Bani, and acacia tree groves). You will also cross vast fossil beds, stopping to make a fossil hunt. We’d suggest you take picnic lunch with you, to eat en-route, or take lunch at camp before setting off. Spend the night at Foum Zguid at Bab Rimal guest house. From Taroudant today return to Marrakech, via the adventurous route across the High Atlas mountains, crossing at approx. 2100m (at the Tizi n Test pass – weather dependent) through some breath-taking mountain scenery. The road is single-track in places and steep on the ascent. 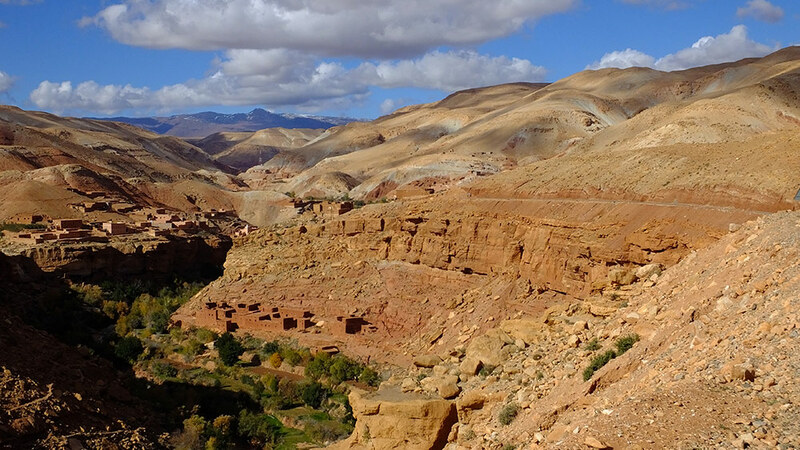 Descend via the villages of Ijoukak and Ouirgane, and alpine peaks, eventually reaching the Marrakech plain.